The Dead Shall Walk the Earth... again. This project started back in 1994 when I picked up Warhammer for the first time. 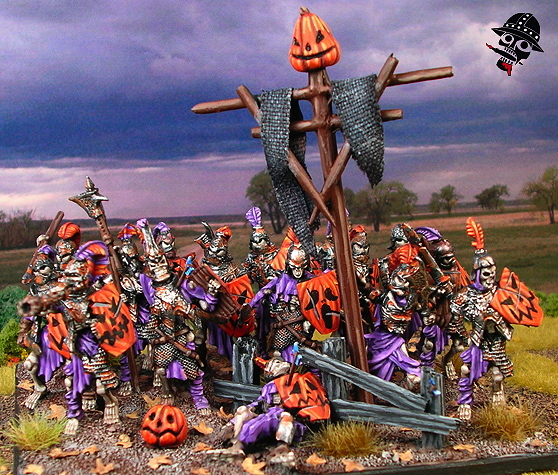 At the time I was dying to get an undead army, but was stuck with the goblins that came in the first Warhammer starter box. I remember that box came with cardboard cut-outs of some figures as well... Back then they didn't have Vampire Counts and Tomb Kings, just undead and you could mix ghouls, vampires, zombies, and mummies. I didn't have the cash though to get into undead, so it stopped in its tracks. Then in 1996 I came into a couple of jobs here and there and blammo, built a huge 9000 point undead army for warhammer... Three months after I finished it, the vampire counts book came out and my army went down to about 3000 points and I couldn't field half of the figures. Another few months later and the next edition of Warhammer came out and my army was reduced to nothing; it was in the days when a new edition of Warhammer nullified all of the old army books. 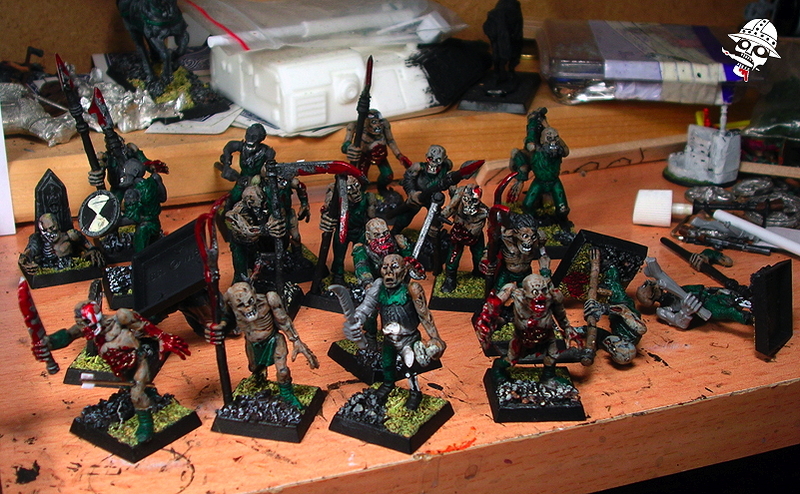 That was it for my undead until 2009 when I dusted off the old figures to build an army for Hordes of the Things. That was a lot of fun, and I was able to make essentially the undead army I always wanted... Except not quite to the scale that I wanted. That was a lot of fun, and that army conquered and was conquered many times over the past couple of years. 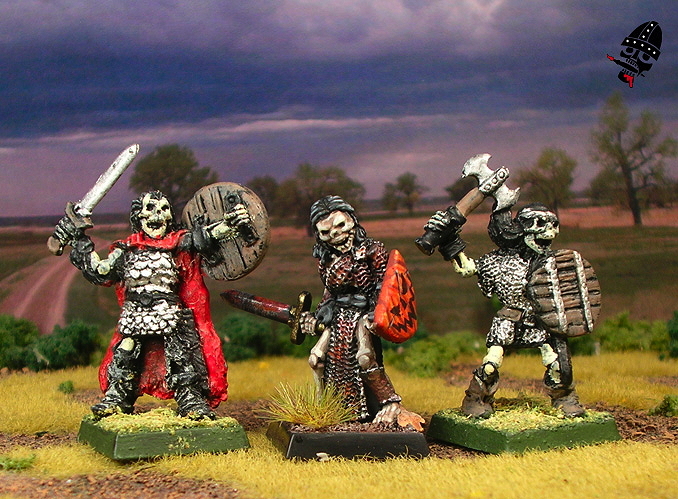 But then Mantic Games relelased their Kings of War rule set last month and the undead project bagan again. Since it has become apparent that this article is insanely large, and I don't want to take the time to split it up, I put in this snazzy little table of contents! Thanks to Mantic games, I could finally put together an undead army to the scale I wanted, in a way that I wanted, and without having to use insanely complex rules (i.e. Warhammer). Furthermore, Kings of War is a great rule set that is designed to work on the unit level, not with individual figures. This means it's diorama time! 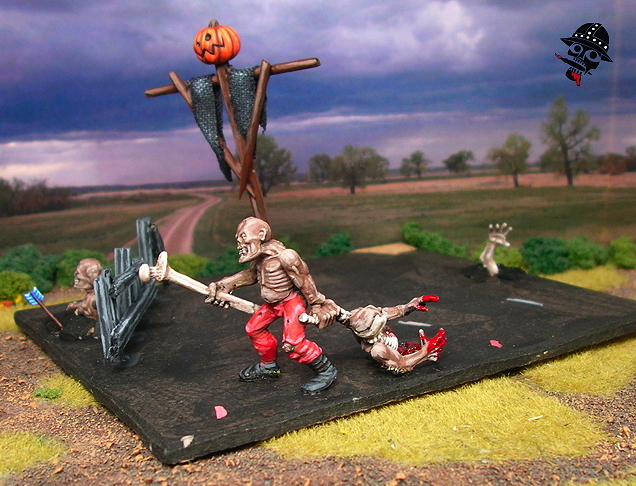 My plan is to do some really great Halloween themed diorama bases. So that's all I need to complete! What's the timeline you ask? Well, I've decided to run this for the Tabletop Gaming News' Old Project Challenge, which starts on November 30, 2010 and ends on February 28, 2011. That's just three months to complete all of the above! It might be too much, but we'll see how far we can get in that time... So, now, let's look at what we already have. 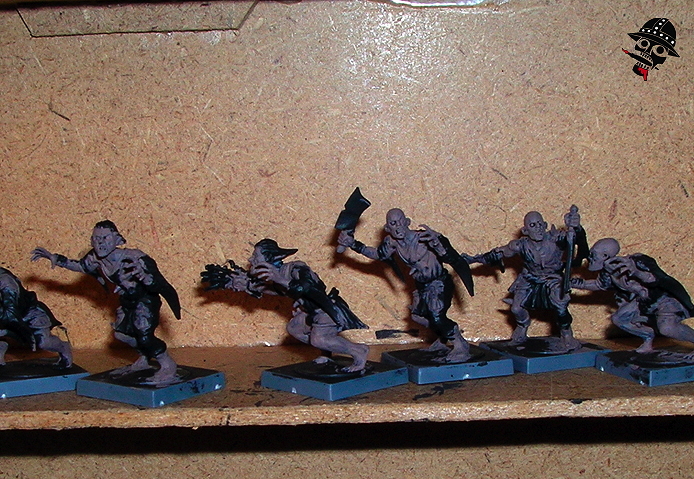 Here the old undead foot troops get ready for some paint and generally more TLC. In the picture above we see the four piles of old figures that are to be fixed up and re-made into a very Halloween-esque undead army. 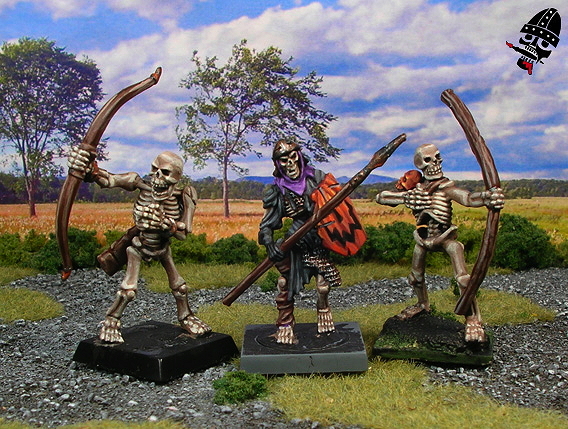 The wraiths, skeleton spearmen, and skeleton archers will get completely new paintjobs. 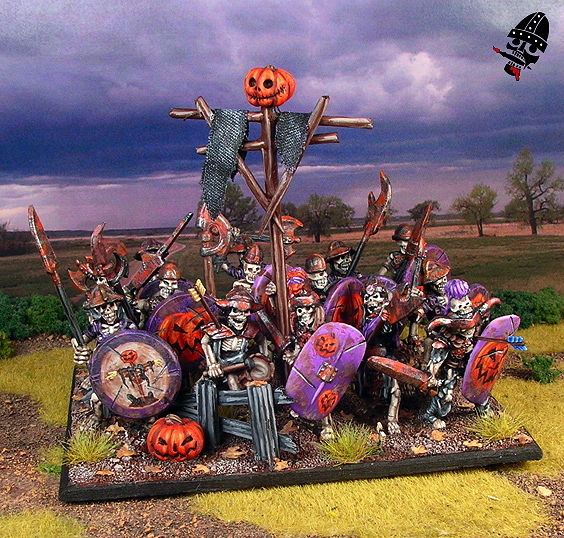 I do have six skeleton spearmen that I used for my HotT undead army that won't need re-painting, but the remaining ones will. The armoured skeletons in the above picture will play the role of revenants. I have eight of them already painted for my HotT army, two of which are visible in the pile there, with their arms removed; I am going to reposition them, but they won't require any new paint. 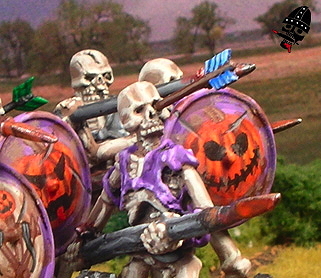 It's worth pointing out the two armoured skeletons with red discs for shields; those are what the painted jack-o-lantern shield-wielding skeletons in the picture looked like before they got paint! Finally, I have a whole schwack of figures from Mantic Games still on the sprue. Naturally I wanted to have a printed copy of the Kigns of War rules, so I decided on the Mhorgoth's Revenge box set, which includes a number of undead figures along with dwarfs. In that box I got a catapault, 20 skeletons, 20 revenants, 10 ghouls, and 15 zombies. 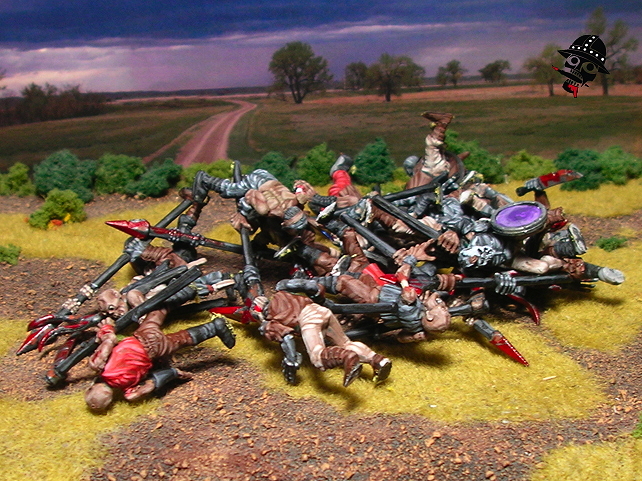 I plan to use the zombies for skirmish action, but everything else will get paint for the Kings of War action! Here are the droves of old undead cavalryl along with a few chaos knight horse bodies. In the picture above here we see the cavalry. 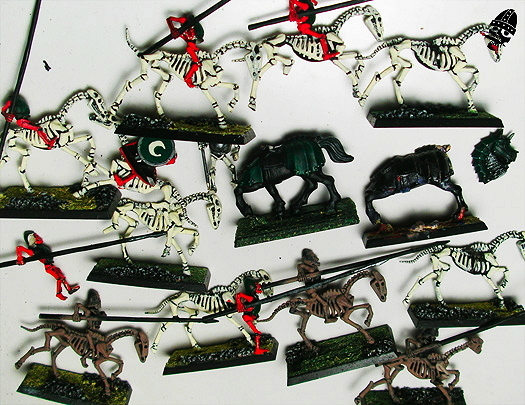 I have enough to do a regiment, but I don't want just plain old skeleton cavalry this time around. I really like the Mantic cavalry, but can't justify buying some while these guys were lying around, so I am going to use the skeleton cavalry, some chaos knight's horses, and and extra revenant command sprue from Mantic to convert my own! Should be fun. These characters are already painted up and looking for some action! Above we have the first of the characters for the army! Characters in this game will really make or break the army I think, especially since the rules don't allow them to join units. From left to right we have the female necromancer holding her jack-o-lantern, then Mhorgoth - well, my version of him - which is the Gauntfield figure from Reaper. It's a fantastic figure and I really look forward to using it! Finally on the far right we have the first revenent king, stolen from one of my HotT elements and *almost* ready for action; he still needs to be properly based. Now on to the characters that still need paint. Reaper has some nice figures, and they are pretty reasonably priced. I decided to use the Reaper figures instead of Mantic's just because I liked them a slightly more and I could buy them off the shelf with a soon-to-expire gift prize that I had... They are great figures, and will look much better when they get some paint! These are characters I have available... Some likely won't be included in this project. Finally, above are the characters that remain. They are labeled, and the first revenant king is in this one as well since he isn't technically ready because he needs basing. There are two Liche Queens (using Liche King rules) above, which means there's one more than I actually need... 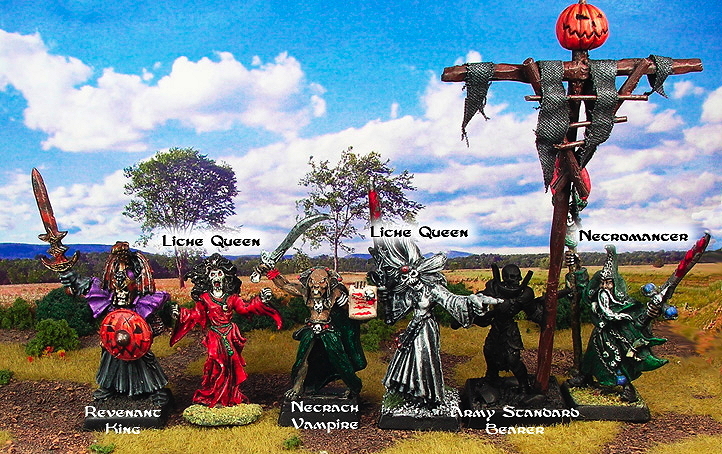 But I'll likely paint the red Liche Queen because it's such a cool model. The other liche queen I already call finished, even though it's quite sloppily painted :) The Necrarch vampire and the necromancer on the far right are very unlikely to be repainted since I am not all that keen on the figs... And the army standard bearer is a great little figure that is just primed at the moment! So that's it for the plan, now it's on to the work! In the coming weeks (outlined below) stay tuned for all the progress on the project; first up will be the wraiths and perhaps the archers. The basing scheme I am planning on is a pumpkin patch or cemetary theme, so that should keep me busy as well. In the mean time, check out some test figures. Mantic Skeleton, Reaper Miniatures Skeleton archer. They still need proper basing. As you can see from the test figures above, the scale of the various brands of skeletons I am using for this projects aren't quite perfectly matched. The games workshop skeleton has huge poportions. The skull on there is bigger than the head and helmet of the Warhammer Empire figures I've been painting... I have seen a lot of people complain about scale for various figures, but I can't believe people don't complain about scale on GW figures... I mean, they don't even scale well with other figures in their own lines! That being said, I think it's close enough to the Mantic and Reaper skeletons to use together anyway. I wouldn't put the Mantic skeleton beside a GW skeleton on the same multi-base, but I would field them in the same army for sure. This section should be called The Timeline or Details on exactly how I will go wrong since schedules are rarely kept in the miniature gaming hobby world ;) That being said, I like lists and timelines. Not only do they help me plan for what I need to paint and by when, they also show how painfully off track I can become! So, let's get to it. Army Characters Week 9... Jan 24, 2011 Jan 24, 2011 Already done! And so the project begins. 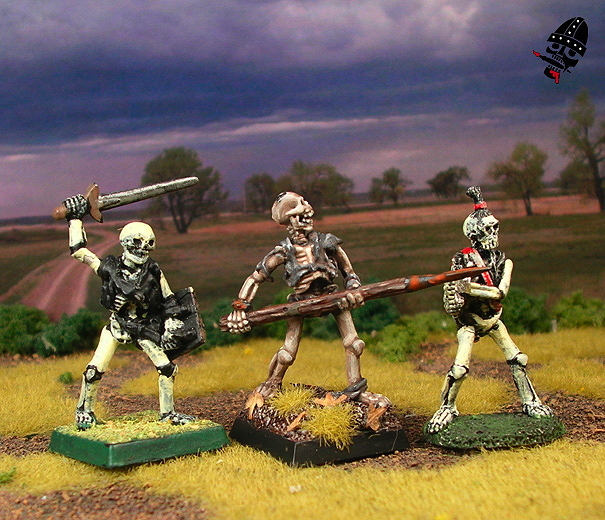 When I started the old Hordes of the Things undead project a couple of years ago - late autumn 2008 - I remember getting really tired of painting skeletons. The problem was that I had a light brown that I was using as a base coat for the skeletons, and I had an ivory that was the top highlight. I had to mix the highlights inbetween every time I painted a group of them. Half the time the mixed paint would dry before I got through the group. All that extra hassle really took its toll on my enthusiasm. Shortly after I finished that project, I stole a bottle of paint from another colour (one I rarely used - went down the drain) and did a permanent mix of the middle highlight. Now the skeletons fly by. On the topic of flying by (the wraith unit in Kings of War has the 'fly' special ability), the wraiths are coming along rather well. I have painted about four of the nine that I planned to paint; they were basically my test figures. It looks like the figures themselves will be done today or tomorrow. Great news! Grenadier figures, but I realize now that it isn't... does anyone know? Contact me if you do! While painting the old wraiths it became obvious that their style was quite different from modern miniatures. Instead of having cloth with largish, smooth and angular folds, you get lots of tiny little wrinkles. I think it still works, but it looks a bit cluttered compared to the modern style. The other thing is the basing. I plan to put the figures for these projects all on multi-bases like the ones I did for my Empire army. The difference will be that instead of barrels and boxes and plain-old arrows I'll be doing iron/picket fences with pumpkins and perhaps even the odd grave stone. That is going to require some planning and sculpting I think, which will take extra time. the bases. It's not artwork, but it focuses my ideas and lists them for later. Thankfully, the sculpting of pumpkins is really fast, although the curing time is likely the worst. 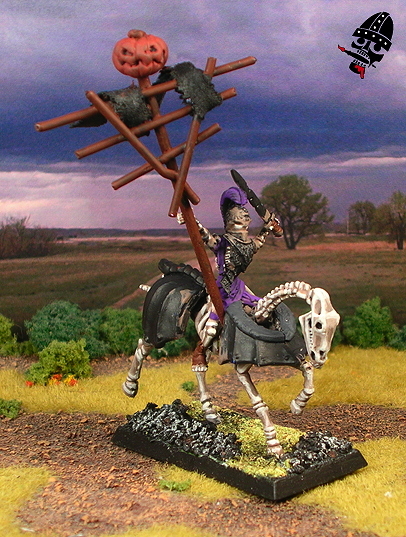 I was also thinking that I would sculpt some birds as well, crows and ravens for the action. 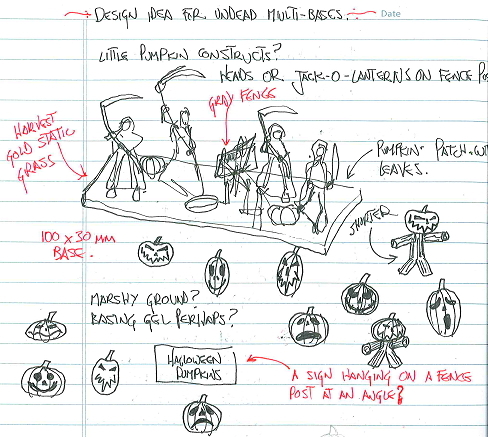 I have some notes on static grass colours, base composition, fence colours, designs for jack-o-lanterns, etc... So, when I sit down to actually do the work I have a good base of info to start with! Planning helps! Work continues on the wraiths... It turned out that painting the wraiths was quite simple. It was the basing that was the real work. It reuiqred some sculpting, designing, building, and painting. Not only that, but since it was my first attempt at basing for this project, it included testing as well! As a consequence, I spent a night sculpting some pumpkins and jack-o-lanterns along with a little pumpkin-headed construct that I had conceived of in the above design image. It was actually quite an enjoyable time actually! It's been a while since I really sat down to sculpt something, and I was surprised that I enjoyed it so much. Perhaps because I've done many of them already, everything came together quickly and without a hitch! After the sculpting it was on to building the broken fence pieces that I had planned. It was easily done as the design is pretty basic, but the thing is, I didn't have a clear idea of how they should look, so it was slow going... That's always the case; if I don't have a clear idea how something should be done or composed, it's slow going. still need paint, along with the fence, and the ground hasn't received sand yet either. After a little bit of effort I finally got all of the bases together and finished them off on Friday, December 3, 2010. Overall I am quite happy with them, and although the base isn't exactly as I wanted it to be, it really represents an image that I really like. Since it's a first try, I am sure that future bases will only get better! the base of each unit is pretty creepy, and gives a feeling of deterioration and decay! The final consideration is the background image for photographing this project; typically I use a different background or two for each project, and I have a few favourites. For these guys I went out of my way to find a few that specifically suited this project. I think I've decided on the cloudy grasslands image used in the above picture, but here are some images of the options I had below... And who knows, maybe I'll switch things around throughout the process! base for another unit that I build later. The second week of the project promised to be a long one... Well, a long one because it was going to require a lot more work than the wraiths of the first week, and a lot more work than the following weeks of skeletons and revenants. In total I needed to paint fourteen skeletons. Most of which required either converting or building. Aside from the realization that I have craploads more work to do, things went pretty well. The archer troop and regiment composition went together pretty well I think. The basing scheme has been more-or-less solidified between the two wraith units and the archer units. So, for a couple of units I likely won't use that often, I am satisfied. The archer regiment all formed up with nowhere to go... They will likely only see action in larger fights where I can afford some less-than-effective units! That's basically it for this update. I think I will start taking pictures of the before and after reality of these figures. Since they were originally painted in the mid-90s I think it would be fun to see how my style and skill has changed in the past fifteen (damn) years. My worst fear is that it won't be all that much change ;) I should also point out that I updated the timeline a bit. Originally next week was going to be for a Revenant regiment, but I started on the skeleton regiment instead... So, there you go. 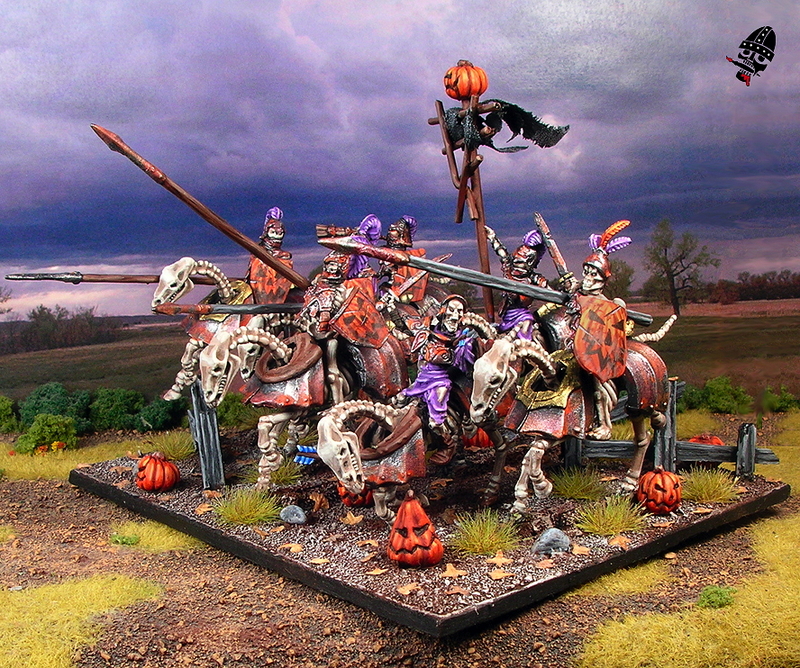 Skeleton spearmen next week! Stay tuned! 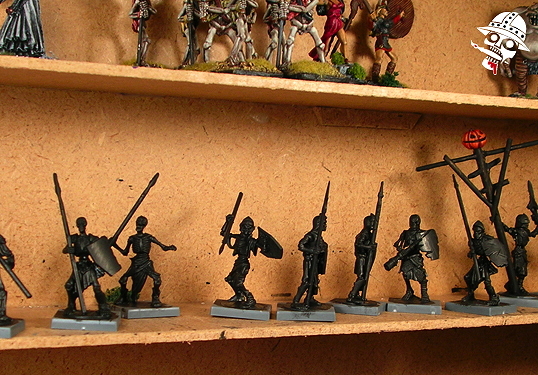 The spearmen unit was one that I was really looking forward to doing. It meant painting 12 skeletons, which is as many as I painted in a week for the archers, and like the archers, it took the whole time. The composition of the unit wasn't nearly as difficult as the wraiths and the archers were, but still it took a bit of work getting all the figures to work together properly. all the figures on a single base. The dead skeleton really looks like it fell out of the ranks as well. I call this one the eye-catcher. It's cheesy, but it's fun. There are a couple of other figures with arrows in their shields, they are from the Hordes of the Things elements that I had done in 2009. Most of the rear ranks are from the HotT elements, while the front ranks are fixed up skeletons from the old undead army I painted in the 90s. all of these figures... I should have simply used the old ones as-is! 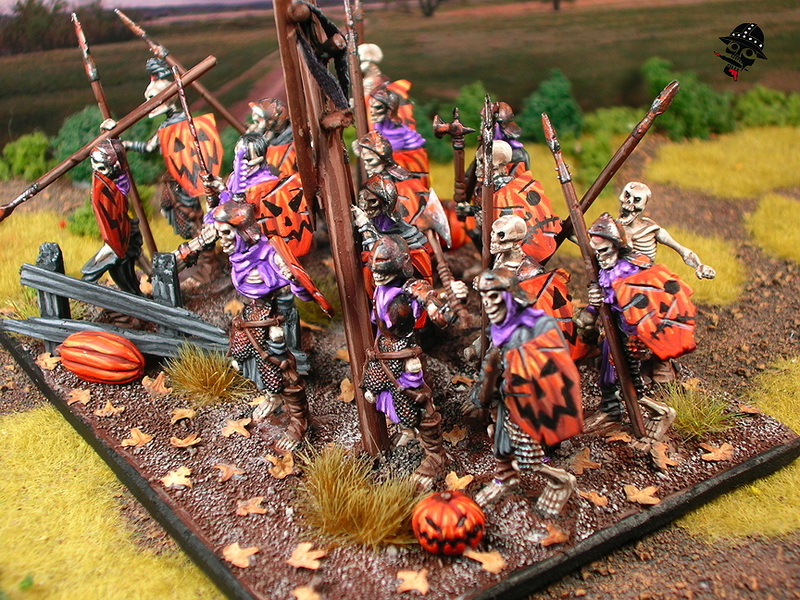 There's also an interesting story behind this unit of skeleton spearmen... I was getting them all laid out on the unit base when it go knocked and spilled all the figures all over my desk and floor. Thankfully none of the figures were damaged from the fall... But the problem was that one went missing! I searched around my desk for hours. I almost started to lose my mind; how far could it have gone? I was even looking around through the rest of the house, imagining that I accidentally carried it around in my pants cuff or something. I finally gave up on it, built out the unit, based it, an finished it off... It wasn't until I started painting the Revenant unit that I found it... I went to clean my brush and noticed that there was a tinkling in the bottom of my (very dirty) brush water... Anyway, I pulled the figure out and based it up. See it below, along with a couple of 90s painted skeletons. better than it's 90s-painted counter-parts. 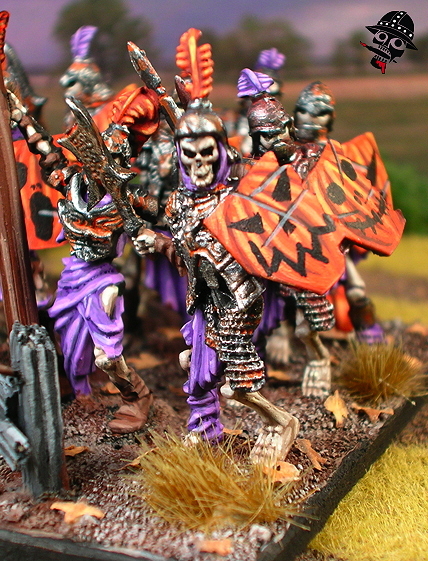 For more images of the skeleton spearmen, check out the Undead Gallery. Well that's the end of the third week... On to the first Revenant regiment for next week! 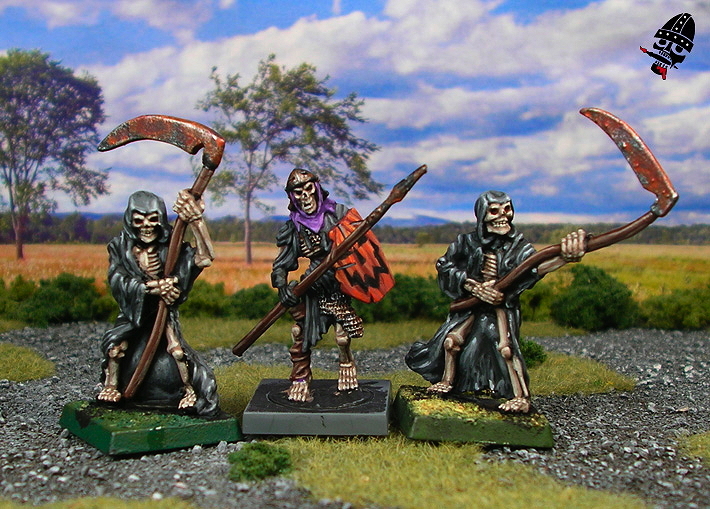 After painting the skeletons, the Revenants weren't all that bad. In fact, I had them done early in the week... I had been working on them while waiting for under-coat or glue to dry during the skeleton spearmen week, so they were pretty much ready to be painted when the week started. It was also the case that I had a number of figures ready to go from the Hordes of the Things army. Even so, I ended up using fewer figures than I had expected on the unit base. The Revenant regiment, all mustered up and ready to go. While painting these guys, I realized that they must have been re-equiped after they were raised, at least partly. But I figured that they'd have pretty poor maintenance skills, so their shields and weapons would start to rust and chip away pretty quickly. Scuffs in the shields and rust on the armour and weapons would happen pretty fast; after a few battles and a day or two of rain the shields would be barely usable, and weapons and armour would begin showing visible and copious amounts of rust. A bit of fun on the unit base. Overall, this week's work went really quickly. The revenants came together very fast. It's a case of me getting to know the project well enough to speed through it. There were a few snags, for example the slotted figures designed to go into slotted bases. I built a little slot in the unit base with some balsa wood, and it worked very well. Other than that though, it was cookies and cream. 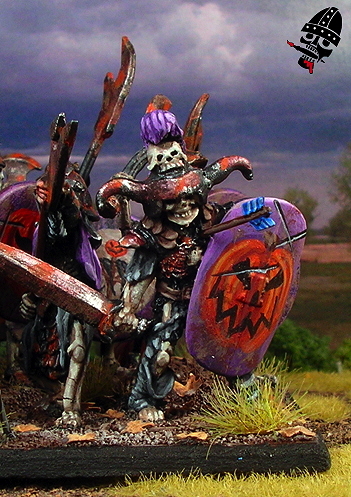 For more images of the skeleton heavy-armour troops, check out the Undead Gallery. So, that's it for week four, and the project is one-third (1/3) done! Four weeks down, and eight weeks to go! Along with working on the revenant cavalry, I've been working on some of the characters as well as the odd single, one-off mantic figures... Hopefully everything will still stay on track, but I imagine things will get hairy once I get into the zombies... anyway, until next week! Made from an old GW skeleton and a Mantic Revenant figure. Week five finishes with a success and the momentum on the undead army for Kings of War continues! As I put this together, I am working on the catapults, which are coming along well! The Revenant cavalry regiment is complete! I am pretty happy with it, and I think it compared well the the GW and Mantic versions. The revenant cavalry (or Black Knights depending on your specific company) took a long time... In fact, the Revenants on foot from week four actually got finished around mid-week, and so I had a week and a half to finish up the cavalry. The thing was that I had to convert every last rider using bits from the Mantic Revenant commant frame, some GW Empire (and Battlemaster) horses, and the old GW skeleton riders (which are similar to the Khemri riders). are all blocked out waiting for highlighting and then metallics. The fact that they required a lot of work along with all of the holiday action meant that they didn't get done quite on time... So, the way the timeline works is that I actually like to be done the unit or units by the Friday before the deadline... This gives me a couple of days leeway... Well, the cavarly were actually finished last night at around 11:30pm, meaning I only made the deadline by half of an hour! The other thing about these guys is that I ended up using seven jack-o-lanterns on the base! Why? Well, I painted up eight riders for this base, but since it's actually quite a small surface area for such long figures, after staggering the figures on the base, I could only fit seven... Which meant there was a lot of white space. That, along with the fact that I just wanted to have more jack-o-lanterns on my bases meant that quite a few went on there... I really like the look of it. The consequence though is that I'm almost out of jack-o-lanterns! Time to sculpt some more! Over all I am very happy with these figs. Everything from the fiddly horn-blowing skeleton build (note in the picture above that the horn-blower is actually holding the horn to his mouth), to the banner bearer and the banner itself with the blowing fabric, to the falling rider worked out very well I think. The horse jumping over the fence didn't turn out quite as well as I would have hoped though, but nobody's perfect... Anyway, see all the pictures in the Undead Gallery starting here. 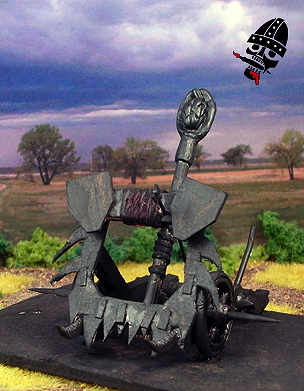 Next up are the catapults, and then after that the zombies. The catapults should be easy to finish on time... thankfully because the cavalry ran a bit late. And then come the zombies... I realized that I will have to repaint between 24-30 zombies each week for two weeks in a row! I will likely reduce the output for the zombie part of the project from two regiments in two weeks to one regiment in two weeks... Otherwise I likely won't get even close to being finished on time. We'll see how it goes... until next week! Given that this week is already rolling, and that I have taken some pictures already, I figured I'd start the update now, on Tuesday January 4, 2010. With the cavalry from the previous week running a bit late, I'm not yet into painting yet. So far I've done some scratch-building and sculpting. I needed to replace all of the jack-o-lanterns that I've used up until now, as well as fix a few thinks up on the mantic and scratch-built catapult. The catapult build actually took me some time... Well, a few hours more than it should have. I actually built it entirely using a slightly different design, but it didn't work and I had to take most of it apart and start over. I had used a more historically-accurate design for the catapult, but added round shields where Mantic's shields were. It ended up looking like a poorly detailed insect model... For the second edition I simply copied Mantic's design with card. The wheels are made of some extra wheels I got from Irregular miniatures. 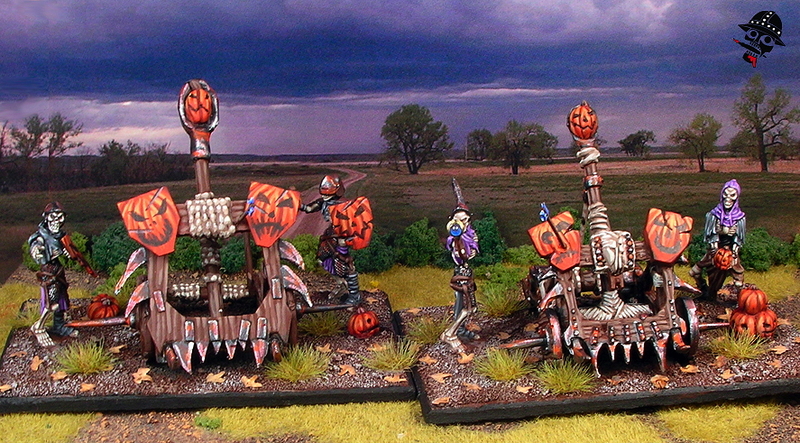 I also changed the catapults from skull-throwers into jack-o-lantern throwers. I like the idea a bit better, and since the Green Goblin character from the Marvel universe has firmly ingrained in me the idea of exploding jack-o-lantern projectiles I think it makes a bit more sense than skull projectiles... even tough skulls are much more historically accurate. But I digress... Along with sculpting jack-o-lanterns for the catapults and catapult crew, I did a few one-off jack-o-lanterns to decorate bases and whatnot. I also converted a few crew for my catapult from the catapult crew frame and the left-overs from the Revenant command frame that I used to convert my Revenant cavalry. They were pretty easy to do thanks to the extra bits on the Mantic crew frame. They were fun to paint up. Once everything was together, it all painted up pretty quickly. The biggest snag was all the brown... I painted droves of brown lines for the catapults and a few brown bits on the skeletons themselves. I find that it's best to have everything blocked out before highlighting. That way, I can highlight all the browns at the same time. The one drawback though is that when you have a lot of brown (or whatever colour) it's a lot of painting for that one colour... Anyway, it wasn't too bad. Along with the catapults I painted up one of my characters - the second lich king - and another revenant figure. I am finding that it's best to throw in an extra character figure when I am painting up troops. It doesn't add all that much extra work, and it allows me to get through the characters that I need. Actually, as it turns out, I don't need to paint any more characters to fill out the 2000 point list that I've made, which was the goal of this project to paint. Which brings me to the zombies. I realized that a zombie regiment requires 24-30 figures, and that I'd planned to have to paint up two regiments in two weeks! Quickly looking at the math I realized that I'd have to paint up 24-30 figures in a single week, which is simply impossible for me. Even if I could do it somehow, I wouldn't be able to do it twice in a row... So, I have changed the timeline from having two zombie regiments back to back for week seven and eight to having two zombie troops. It's a lot more realistic a goal and will still serve me well... However, if I have three troops worth of zombies done by the end of week eight, I might replace the week alloted to characters with another week of zombies in order to have two full zombie regiments (and thus a horde if I want). If not, well, we'll have to wait and see. I threw together these three test figures. All GW figs with different schemes - I had to figure out how I was going to paint the unit after all! After painting them, I ranked them from most to least favourite. Incidentally, number 3 resembles their original 1998 paint scheme closest. I also didn't paint over the enameled blood that I did back in 1998 either because I liked it! So, some test figures came together pretty quickly. In one day I painted up three, which is pretty good I think. I am also very happy with how they turned out. For these, I wanted to do something that nobody else does, since there are millions of zombie outs there already. So, I did some searching of my memory and realized that a dry climate with only barely-aged corpses would be the way to go. Thus, no obvious green infections that would require moisture. Such conditions produce dark grays in decomposing skin. Also dark brown works as well, depending on the skin colour of the dead person. I find it's easier to put fiddly figures right on the unit base. Note the one on the left there has two new arms to go along with the 1998 paint scheme that he still sports. He's pulling along half a corpse. The fence on the other side should be familiar from all of my other unit bases. With the unit bases ready for paint, and the paint scheme hashed out, the work begins on painting in earnest! So it turned out that as I started working on this unit, I decided to use a different unit base than the one I originally planned to use! The one above I decided to save for the second zombie regiment, and instead use the unit base below for the first regiment. matches up with the fence in the above base? As you can see in the above work in progress shot, the figures have been painted and the unit's standard is painted as well and fixed in place. There are also a few extra elements... The arrow, the zombie coming out of the ground, and the protruding arm at the back of the base! The above base is actually done and ready to have the painted figures attached. After the painted figures are attached we do the basing, and then we're done! A front shot of the WIP base for this unit. The painting on these zombie turned out to be very simple. They were pretty much entirely re-painted. I kept the enamel blood, as well as the skull bone for some (but not all) of the figures from the original paint as well. Although this might seem to make things easier, what it actually means is that I have to carefully paint around (and not over) the old enamel paint when I am doing the base coats for the colours, which translates to a lot more work. However, the reason they were easy to paint is simply because they are all essentially painted in only TWO colours! That's right, just two... Well, that's not entirely true, but mostly. Basically there is black/gray and brown. Technically, I had some black and some gray surfaces, but the first highlight for the black was the base coat for the gray. So, I still did all the base coating at one time (both black and gray), but when I got to highlighting I highlighted the black and the gray at the same time. Of course, the gray highlights go lighter, but there is a lot of crossover. The same was true for the dark brown and the light brown or off-white colour. ready to be fixed to the unit base. Oh the humanity! Of course there were a few other colours, including orange for the jack-o-lanterns, red for a small number of figs, and one purple shield; those extra colours were minimal, so they went fast! Once they were done I cut them off of their individual bases (see the pile above) and then glued them on, one-by-one, onto the unit base. I ended up fitting 21 zombies on there. The front rank of the zombie regiment all assembled and ready for some action! So, to sum up... I was shocked that I could paint 22 zombies in seven days, but I did. They were simple, as outlined above, but it's unprecedented for me. Twenty-two in seven days? But, at the end, there they were. So the whole regiment came together even though I had planned to only have 10 or 12 done. It bolstered my confidence in being able to repeat it for week eight! Second, check out the zombie regiment starting here in the Undead Gallery. It was fun and I was pretty happy with the outcome. After the successful completion of 22 zombies for the previous week's zombie regiment, I decided to try to paint the entire second zombie regiment this week. Last week I ended up having one zombie left over, meaning I only needed to paint 20 zombie for this week to put together a second regiment of zombies that was the same size as the first. painting over the old paint scheme while carefully avoiding the parts painted with red enamel as blood. and it is also ready to be painted. Actually, the gray base-coat is done already! He's coming to get you Richie! I mean, where are the women? Assumable they are re-animating villagers to make up the zombie hordes... Would they really take the time to remove all of the women and children from the piles of corpses before throwing them against the living? The breasts could be covered with scraps of cloth if they were worried, or removed entirely and replaced with bare rib cages... And what of the children? It's really, and truly a glaring ommission. It's not just Games Workshop either. 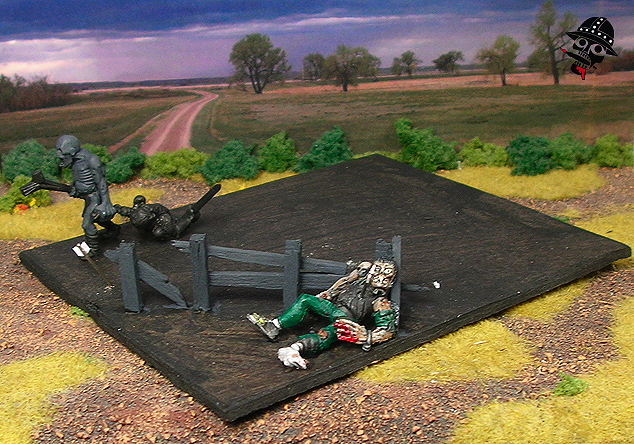 Wargames Factory has modenr zombies, and none of them are women. Also Mantic themselves do scantily clad all-male zombies that were likely designed to be used for fantasy and modern wargaming... but not a woman anywhere. All I have to say about the stunning lack of female and child representation in these figures is BOOO! Basically they are saying that not only are women are not good at fighting in their living armies (elves, dwarves, humans, etc) but that their corpses aren't even good enough! Sexist basta*ds! 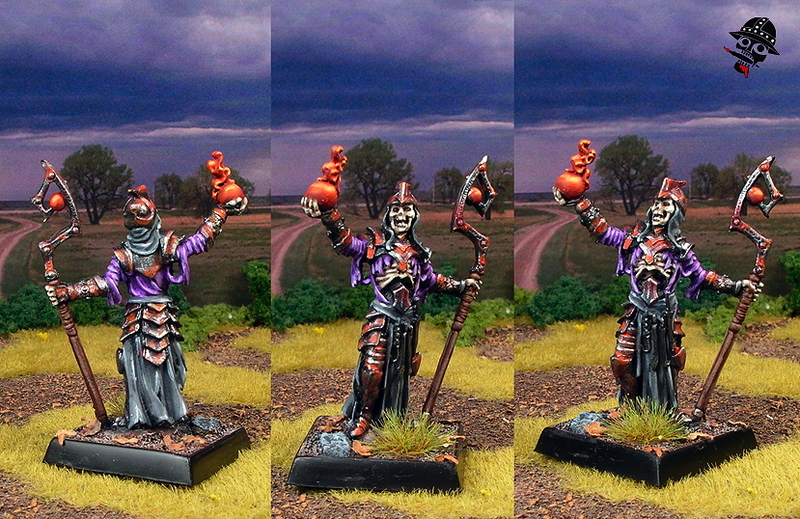 I also managed to finish off the final character that I really need for the Kings of War army this week as well. In fact, every single figure I planned to paint for characters is done, with the exception of the vampire Revenant king that I planned to do... 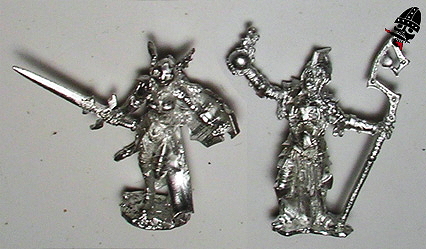 I don't think I'll bother with her though, because I can use all of the left over revenant figures as revenant king characters in the army! The last of the Lich King figures done! She's a character figure, one of my favourites! So, that's it for zombies! Two regiments can be collapsed into a single horde for larger games. Honestly, I can't see needing too many more of these, but who knows. Maybe down the line. Certainly not now though. 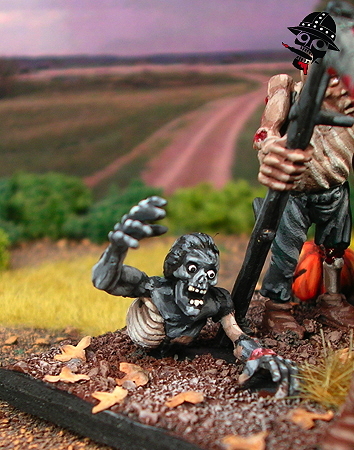 To see all the figures in detail that I painted for this week, check out the Undead gallery starting from here. Until next week! Week nine turned out to be a surprise for me. As outlined above, I should have had only a single zombie regiment done by now, and I was planning to get my characters for the army done this week. I was trying to get the characters done earlier though so I could concentrate on finishing the zombie regiments... But, they're all done, so I am jumping ahead! It's time for the Mantic Skeleton regiment that was planned to start on January 31, 2011. My Mantic skeleton regiment all built and primed, ready for painting. I thought I might have dilly dallied with this unit, as a way of giving myself some relaxation time after all the hectic painting of the zombies the last couple weeks... but I didn't! It took me a couple of extra days to get it finished that I had hoped, but I am still 20+ days ahead of schedule now! It was all the builting required... That step that includes building the figures takes an extra session over and above the standard. Now before you metal-miniature advocates start saying that you don't have to build metals, this time would be required for them as well. It includes temporary basing and prepping, and since metals typically come in fewer poses, conversion time as well! The reason why I didn't have to spend this time for previous units is because I built them all ages ago! That's the real bonus from re-painting old figures: they're already built! After the building and prepping though, these figures went together as fast as all of the other ones. Again I limited my colour palette to esentially three colours: brown, gray and purple. I also used metal and orange of course. The orange was actually a lot of work this time because of all the shields and some extra pumpkins that I painted. 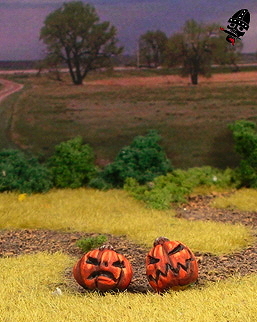 This week I also took some time to sculpt boatloads more pumpkins as well. 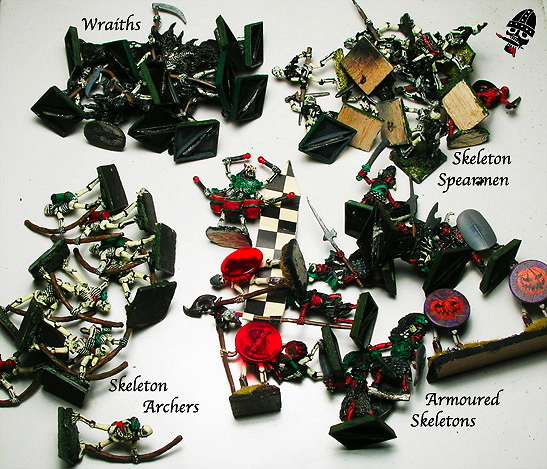 A veritable shambling mess of skeleton spearmen! 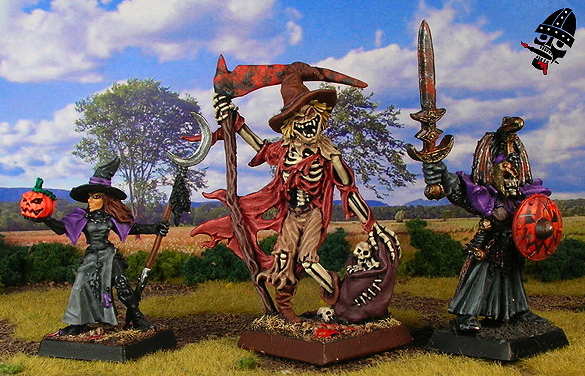 The Mantic figs look great, but they're wearing a lot of armour for standard skeletons! That's it for this week. 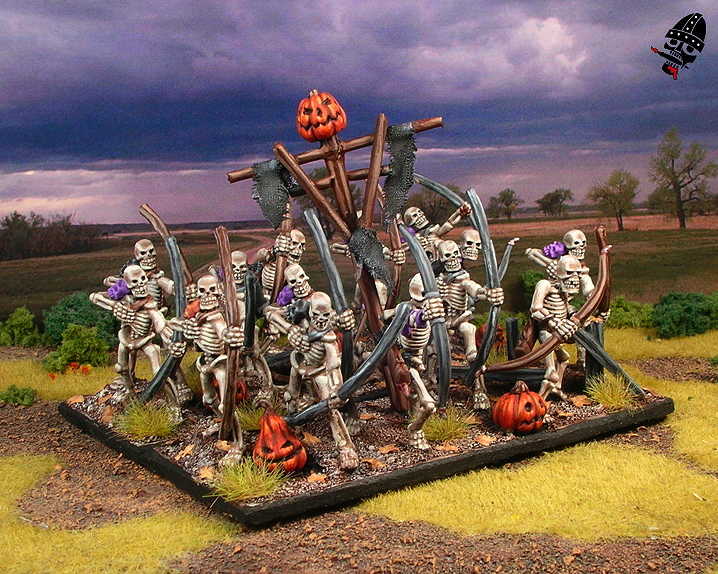 As per usual, please check out the Undead Gallery starting here for all of the detailed pictures of the latest Mantic skeleton regiment unit... So... Is it just me, or is this project becoming more and more of the same? Is it getting boring? I am still having fun doing it, but it doesn't look as new and fresh as it did when I first started on the wraiths and skeleton archers. This project is finally starting to get to me... I did enjoy painting these Mantic figures, don't be met wrong, but by quick count, I have painted a total of 81 skeletons... and that's a lot... But now that I write it out, it doesn't really seem like all that much, does it? Oh well! The small detail on the Mantic skeletons also take some effort, but if I had painted the Mantic figures first, it probably wouldn't have been such an issue :) Also, my current brush is hatched, but I want to finish this project with my current brushes, so I'm holding on to it! The second Revenant regiment, this one all Mantic's plastic figures, is ready to eat some flesh! You might notice something a bit different about my Revenants compared to all of the other ones out there... The deal is that I converted every single one of them to face forward! Mantic had them all facing to the side, making them look quite thin and odd-looking to my eye. I believe they did this to further differentiate them from their plastic skeletons. The Revenants use the skeleton figures, but change the heads and add on some armour. The thing is, I was hung up on the fiddly detail regarding warriors facing in the direction of their shields, so I turned all of their heads forward... Overall, this gives the regiment much more mass I think, since the figures are wider by far than they are deep... I am hapy with how they turned out, and even though they look a lot like the skeletons, I think they look different enough to work well. As far as how I put it together, I basically did the same thing as with every other unit I've done for the army so far. The Mantic integrated little circle bases work perfectly for mounting to the unit bases. Even with the lip around the edge. A little sand, bigger sand, leaves, and the odd tuft of grass cover up any obvious edges perfectly well I think. I took a bit more time on the poses, specifically the head-repositioning and the horn blower. I finally got the horn more or less to the mouth of the blower. Again, I didn't bother with using the end of the horn and opted to go with the more historically viable horn look. 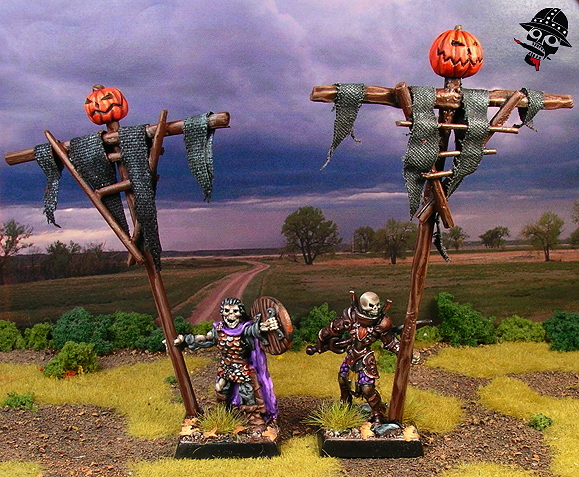 Still, Mantic's figures are so easy to put together that it wasn't any real challenge... Other than that, I went with an oddly-shaped jack-o-lantern for the banner... More of the same at this point really! Check out all of the detailed shots in the Undead Gallery starting here. The ghouls are already well underway. I built them all, primed them, and then through on the first colour so far! 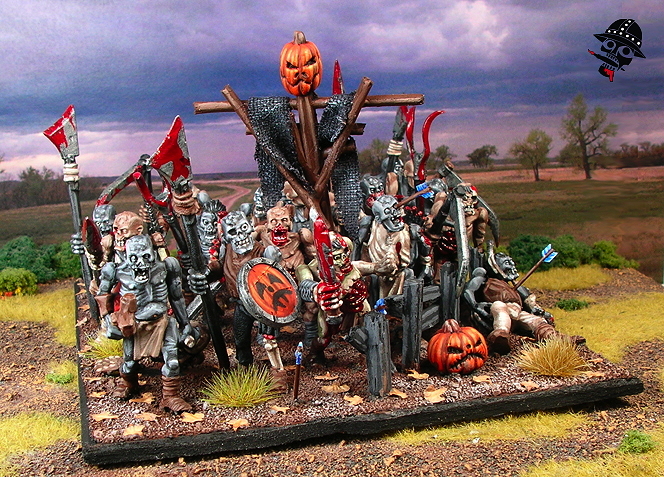 The ghouls will have the same colour scheme as the ghouls I did for my HotT army in 2009. I doubt I'll use the purple clothing though, but stick with browns and grays the way I did with the zombies. The Mantic ghouls primed with the flesh base-coat done! Since i had twelve unpainted Mantic ghouls, I figured I would add in the Games-Workshop ghouls that I did for my old Hordes of the Things army and then built out two troops that could be used as a single regiment if need be. Effectively that HotT army is now gone. It's all be re-based to facilitate the Kings of War action. So, I've decided to dismantle everything that I might be able to use for the KoW action. 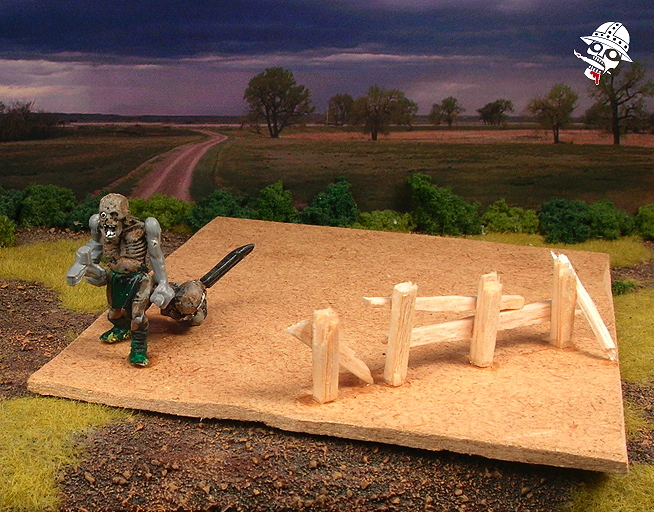 There isn't really much left now that the ghouls have been removed from their old base. Only the cavalry and the giant bats... I will likely leave the giant bats (good for D&D), and the cavalry, since they are already perfectly based to be a Kings of War cavalry troop! But enough of that! Ghouls! In the end, I decided that I didn't need to use the GW ghouls to stretch the 12 Mantic ghouls into two troops. 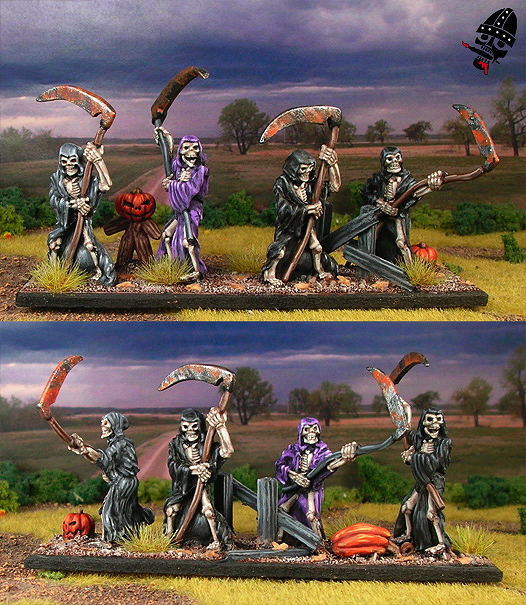 Six ghouls per base looked perfectly good, especially since the unit is a skirmishy, fast unit anyway. 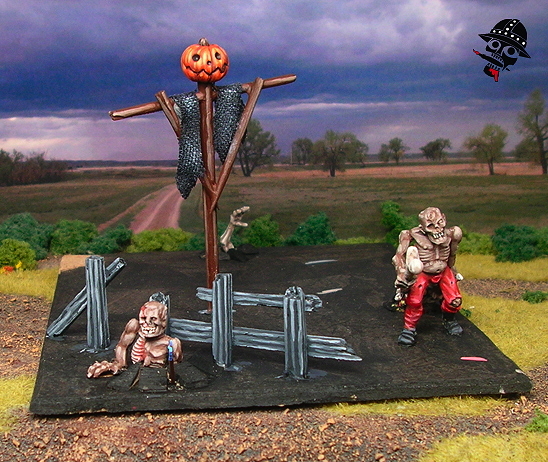 Add in a couple jack-o-lanterns and a fence or two and you have a perfectly good troop unit with six ghouls! I ended up putting the old GW ghouls on 20mm square bases left over from all the Mantic figures for skirmish and roleplaying. 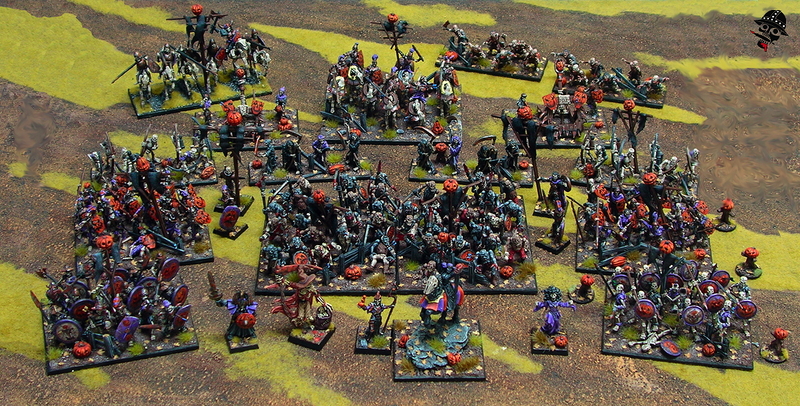 The Mantic ghoul troops stacked into a regiment and ready to devour some flesh! These ghouls went together pretty quickly. Really there are only two colours: shades of black/gray and shades of brown. I realized after I decided not to use the purple-clothed GW ghouls that I should have used at least one more colour on the Mantic figs. However, even though they're pretty monochromatic, they still work for me. The blood adds in the extra colour along with the orange pumpkins. Basing was according to the formula I developed way back with the wraiths, but I did forget to do some arrows. Not too much of an issue, since the ghouls are so fast moving they'd be a lot harder to hit anyway ;) Of course, we'll see how that shakes out in games terms in the future. 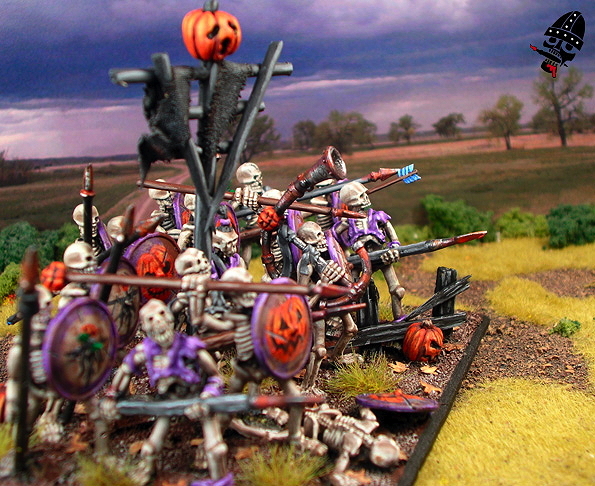 One of my buddies suggested I use the little pumpkin constructs instead of undead rats for the Skeleton units! It was a good idea, so I jumped on it. A little sputty and paint and they turned out well! I also had to polish up some undead rats for the skeleton units. Rats give the skeletons super healing abilities for a premium in points, but they are useful. I was going to use some rats I had on hand, or the Mantic skeleton dogs... 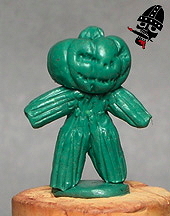 But then my buddy suggested I use the pumpkin constructs that I first used on one of my wraith units instead! It was a great idea and I took it. 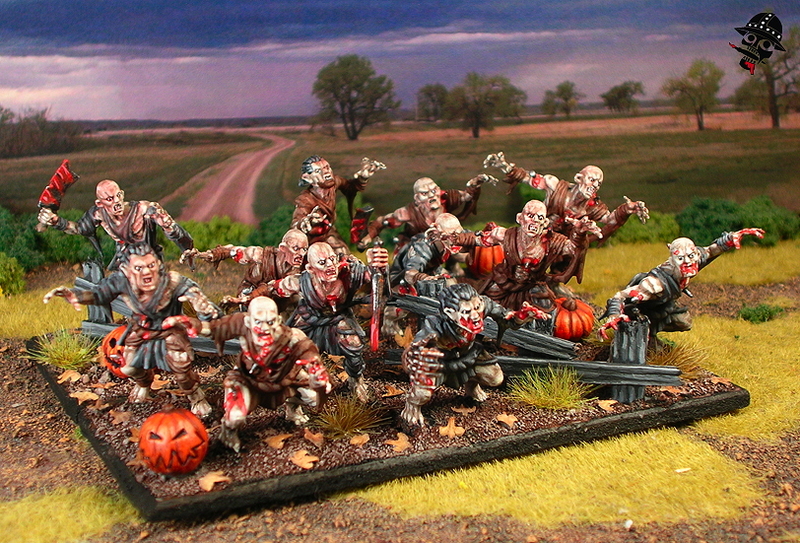 I sculpted and painted them during the same week that I painted the ghouls! So that's it! 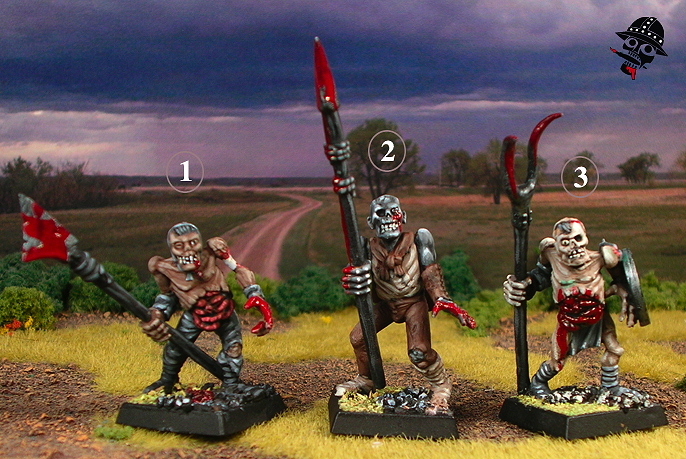 The last unit for this Kings of War undead project! I may end up adding more units to it if my buddies build out bigger armies, but for now it's done! DONE! 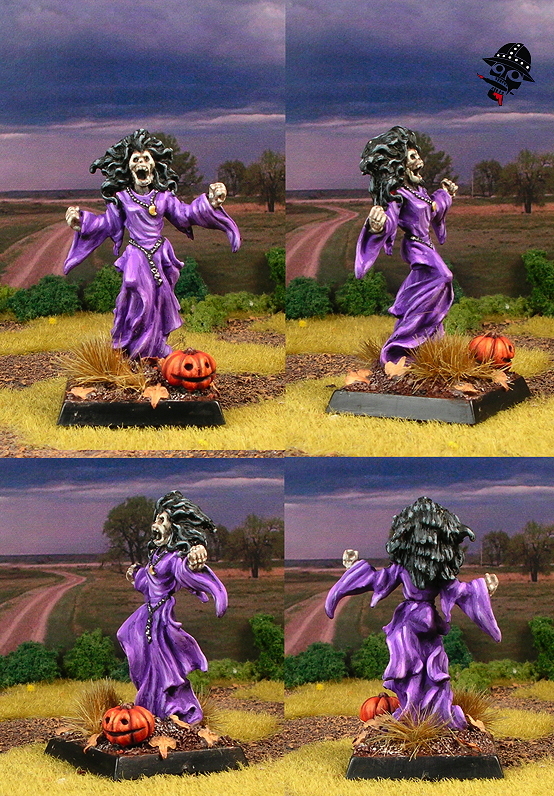 In the mean time, check out more detailed shots of the ghoul action in the Undead Army Gallery starting here. After the ghouls were done, I thought that was it! But at the last minute I decided to add in another army standard bearer. They are very useful in the game, and cheap to field. In fact, I would advise anyone who has a Kings of War army of any kind to fill out their character/hero slots with army standard bearers. Since you can take one character/hero per unit that is a regiment or a horde, you can field enough of the standard bearers to help hold up your entire army! Why you ask? Well, they let you re-roll Nerve checks that would result in your units routing, thus keeping you in the game as long as possible! along side the first standard bearer I did. Instead of finding a new figure to use, I got to work on one of the few remaining skeletons from my old Warhammer army. I really liked the old-school feel of the figure, and thought it would play off well against the brand-spanking-new Reaper figure I used for the first standard bearer. It took me one day to paint from beginning to end! Although, it took a day for the putty to cure inbetween time. The other thing I needed for the army were some tokens. 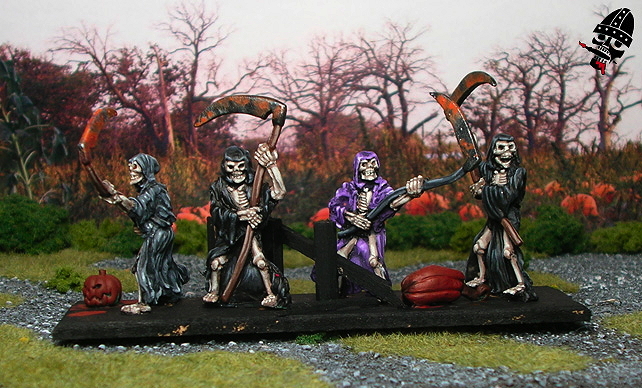 Originally I was planning to make my own casualty marker scheme using dead or dying figures on a little rotating base like I did for my human army. It would have looked pretty cool, but I decided not to. Instead I chose Litko's skull tokens. I bought a set of red ones and a set of white. They have the benefit over little counters in that one glance and it's obvious which units are highly dmaaged. I got 10 large skulls of each, and 30 small skulls of each. The large skulls represent 5 casualty points, and the small ones represent one. All told that's enough tokens to represent 80 casualty points per army! That should carry me I think. The markers for the project... With these, the army's ready to fight! 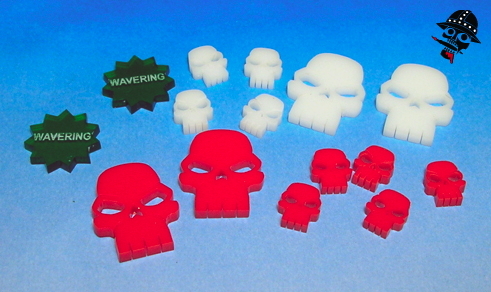 At the same time I also had Litko craft some custom tokens for me with the word "WAVERING" on them. The state of 'wavering' is pretty much the only state that needs recording in the game, and I figured I'd splurge and get some cool tokens to represent it. I'd been looking for an excuse to get special tokens made for a while now! With the project done, there are a few things I've learned. Firstly, that I can paint a crapload more figures than I ever gave myself credit in a short amount of time. For the duration of this project I was averaging just over two figures per day. That's almost as much as Tim! Not quite though... I also learned that it's possible to do an entire large army without too much mental anguish! For me, it's all about expectations. I used to anguish over painting up four DBA elements of cavalry... That's twelve 15mm cavalry figures! I could do that inside of three days now I think! No DBA army will look so intimidating to me again... or any army for that matter. Finally, it made me realize that I could acually do a big army project and come out at the end not only finished what I set out to do, but also two weeks ahead of schedule! With everything said and done it's time to show a picture of the army assembled on the field in all it's wonderful glory! Then again, I found myself wondering if it was all that wonderful and expansive... it looked a bit smaller than I'd hoped! It's a site I like to look at. All assembled it's impressive to me, and since I spent two and a half months up close and personal with it, I feel like I'm right down there with them, ready to devour all of the living to fill my empty soul... muahaHaHaHAHAHAAA.!..!... !